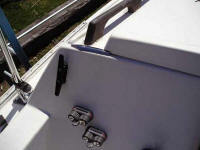 Then I installed the first two cockpit cam cleats; port side for the jib halyard, starboard side for the main halyard. 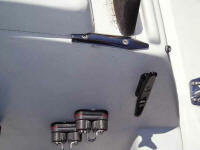 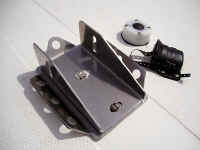 The new main halyard (outboard) and main downhaul (inboard) lines and cam cleats are on the starboard side bulkhead. The new boom vang is visible above the companionway. 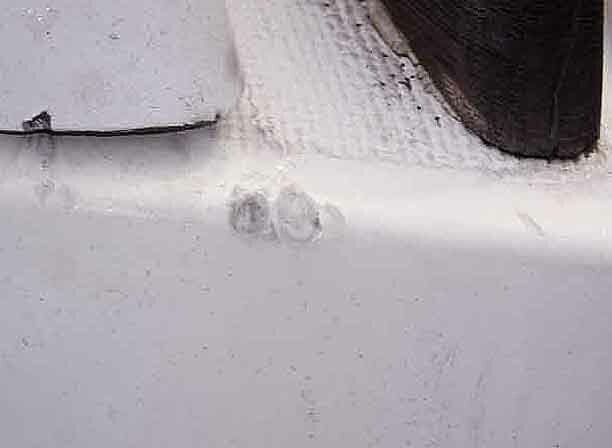 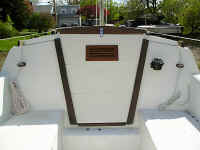 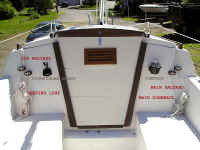 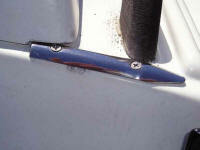 Subsequently, I added cleats to the starboard (photo left) and port (photo below) sides of the cabin bulkhead on which to hang coiled lines and halyards when not in use (see above). 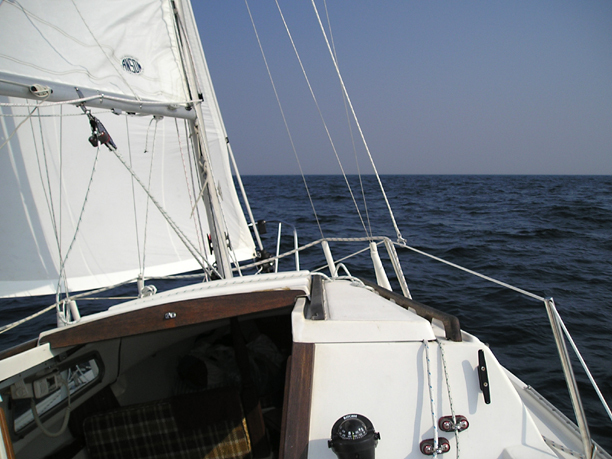 After installing the Furlex roller-furling system, I added its blocks to the stanchions to lead the furling-line aft, and a cleat to the portside deck, parallel to just behind the cabin bulkhead (not visible in this photo), to tie it off. The rub strakes come in various lengths and widths; the smallest was 3/4"X 8" so I cut my pair down to about 5" and drilled a new hole in each. Next I filed out the corners of the pop top just enough to close over the rub strakes, then sealed and fastened each one. 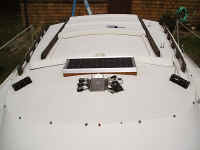 The cabin top is now protected where the lines (main halyard and main downhaul on the starboard side) turn over its edge and down to the cam cleats. 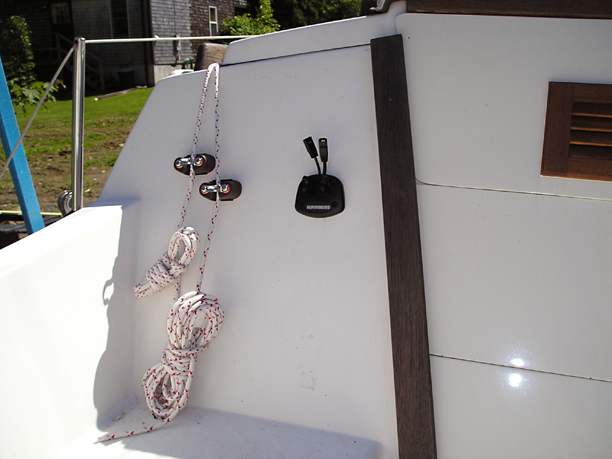 I likewise added the second rub strake to the port side to protect where the single-line reefing line and jib halyard turn over the cabin top. In the spring of 2007 I added a pair of Spinlock XAS/2 power clutches to replace the need for the cockpit cam cleats and makeshift rub strakes. 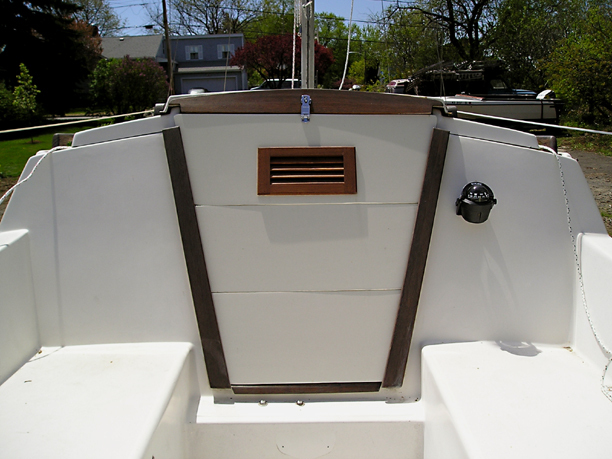 This was a great improvement, though it required cutting down the handrails. 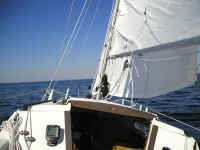 It's never-ending ... but spring has arrived at last, the projects have begun!